2. Totral weight: About 3.5t. 4. Main Motor Power: 3kw; Cutting Power: 3kw. 6. Hydraulic station power: 10-12mpa. 9. Effective width: 900mm Space: 225 Depth: 15mm. 10. Steps of roller: 10steps. 11. Material of roller shafts: 45#steel adjustable. 12. Usage: Roof Panel for Warehouses, Houses, Hangars etc. 3. Electronically Controlled System: The whole machine is controlled by the PLC variable frequency control of the industrial computer. 4. Main Motor Power: 3kw. 5. Step of rollers: 11steps. 7. 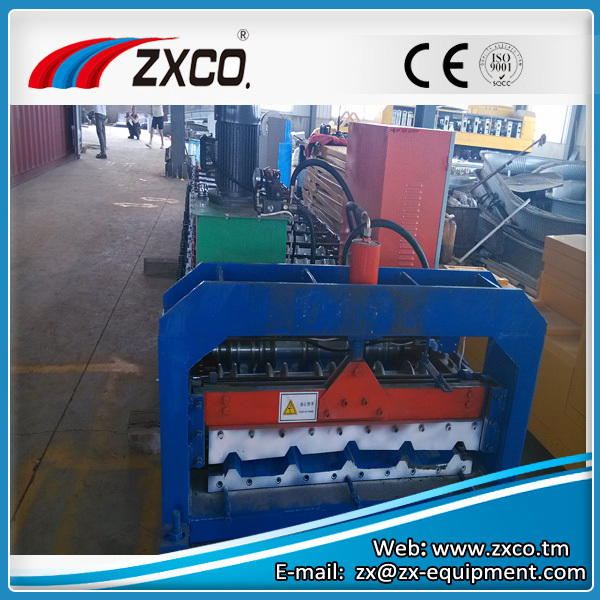 The plate thickness 0.2-0.8mm. 9. Effective width: 840mm Space:210 Depth:15mm. 10. Power source: 380kw 50HZ.